I decided to graph the difference between the share of production and the share of the global adjustment (treating that as a proxy for cost). 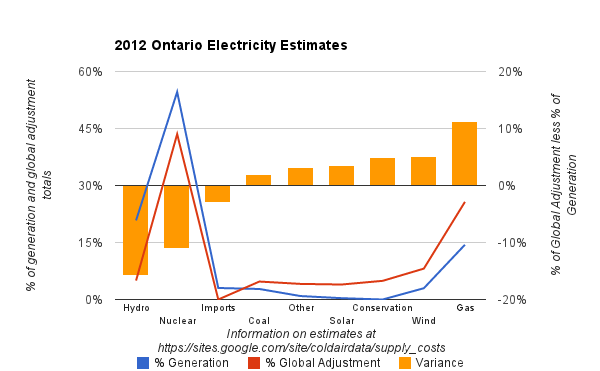 The resulting figures (the orange bars in the above chart) show that hydro is by far the least expensive, contributing 21% of supply and only 5% of the global adjustment charges. The biggest discrepancy the other way will surprise many, as it's gas - responsible for only 14% of production, but 26% of the global adjustment dollars.